Flipkart Republic Day sale is all set to kick off on January 20. The sale will feature hefty discounts on Asus smartphones including Zenfone 5Z and Asus Max M2. Both Flipkart and Amazon have recently announced their respective Republic Day and Great Indian sale that will begin on January 20. The sale will feature plenty of discounts and offers on smartphones. The Asus has revealed that the Asus Zenfone lineup smartphone will also be available at a discounted price during the Flipkart Republic Day sale. The e-commerce platform has also collaborated with SBI bank and will offer up to 10% instant discount to those who will make payment through the bank’s debit or credit card. So, let’s look at some of the deals that have been revealed so far. The Asus top-of-the-line smartphone Zenfone 5Z, which is currently available on the platform for Rs 32,999 will be available with a discount of Rs 8,000. The 6GB/128GB variant will be available at appx Rs 24,999, while its 8GB/128GB variant should have come at Rs 28,999 (appx). Check out the smartphone here. The Asus Zenfone Max M2 that comes with a price tag of Rs 9,999 will be available during the sale at a discounted price of Rs 8,999. The higher end model with 4GB RAM and 64GB storage will be available at Rs 11,999. 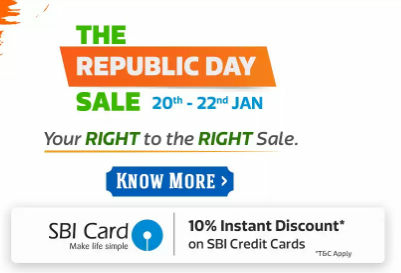 You can also get an extra 10% discount on your purchase if you make payment through SBI cards. Check out the product here. The Asus Zenfone Max Pro M1 base model with 3GB/32GB storage option is available for Rs 9,999 on Flipkart currently. During the sale, you can get this device for Rs 8,999. There will also be a no cost-EMI option available on this purchase. Check out the phone here. The Asus budget smartphone Zenfone Lite L1, which was launched at Rs 5,999 will receive a Rs 1,000 cut during the sale. You will be able to grab the device for Rs 4,999. Check out the smartphone here. Besides that, the Asus Zenfone Max M1 and the Asus Zenfone Max Pro M2 can also be bought during the sale with an additional 10% discount on using SBI bank card at a no-cost EMI. Stay tuned to know more offers and deals of the sale.